Why choose an eSATA card? External storage and professional SSD readers often have two or more interfaces from which to choose, including FireWire®, USB, and eSATA. Your computer has USB ports, may have FireWire ports, and maybe even a Thunderbolt port, too. So if you can just plug into your computer's existing ports, why consider an eSATA card? Performance and cost. Consider the facts that the 6 Gb/s eSATA interface offers superior throughput to that of all FireWire and USB interfaces, and Thunderbolt storage systems carry a price premium over eSATA storage systems. Sonnet's Tempo SATA Pro 6Gb 4-Port card is a cost-effective way to add four high-performance bootable eSATA ports to your computer so you can take advantage of this fast interface. 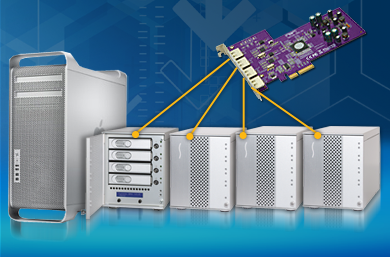 Storage systems with an eSATA interface offer great flexibility. Single-drive enclosures let you easily back up data, move files from one computer to another, or take advantage of a fast SSD. Many multi-drive storage systems include swappable drive trays, which are perfect for managing daily backups and multiple projects. Some systems, like Sonnet's Fusion™ R400SRAID and Fusion F3, feature integrated hardware RAID controllers that manage up to four drives and enable you to create large, protected RAID volumes, yet only a single cable is required to connect these multi-drive systems to this pro eSATA card. Featuring four ports and dual SATA controllers, this Sonnet card enables you to connect multiple systems for fast transfers between them or to improve performance by creating RAID sets from two or more systems. Whether you connect single- or multi-drive systems, or a combination of both, Tempo SATA Pro 6Gb 4-Port supports them at maximum performance levels. Sonnet's Tempo SATA Pro 6Gb 4-Port's fast, 6 Gb/s eSATA interface easily handles the increased bandwidth requirements of 6 Gb/s SSDs. Built around a second generation 6Gb SATA chipset, it offers greatly improved performance over older 6 Gb eSATA cards and is capable of transferring files from a single SSD at up to 500 MB/s. Even greater performance (up to 1,300 MB/s!) is possible when you connect four SSDs and format them as a RAID 0 set. Increased onboard cache enables this Sonnet controller to perform even better in the latest computers as well as in Sonnet's Echo™ Express Thunderbolt Expansion Chassis for PCIe cards or xMac™ mini Server. For maximum performance, you can create a single, large RAID 0 set across multiple drives in two or more enclosures like Sonnet’s Fusion D400QR5 or Fusion R400QR5. Got a Thunderbolt connection, but no PCIe slot? This card is ideal for use in one of Sonnet's Echo Express Thunderbolt Expansion Chassis for PCIe cards—the combo enables you to add 4-eSATA ports of connectivity to iMac®, Mac mini, MacBook® Air, and MacBook Pro computers. This card supports the RAID features of OS X and Windows 8, 7, and Vista®. It supports hot-swapping of drives under OS X, and supports booting from attached drives under OS X and Windows 8, 7, and Vista. You can connect optical drives, too. AHCI compliance ensures installation of the card is simple—just plug it in to any available PCI Express® (PCIe) slot and then start your computer—the necessary drivers are installed automatically. Drive health monitoring is supported through S.M.A.R.T. data reporting. And, for a secure connection, this card supports Sonnet's exclusive locking eSATA cables. When you need to add flexible, external storage to your setup, Tempo SATA Pro 6Gb 4-Port gets you connected, fast. OS X port multiplier support requires Version 10.8.5+. See Performance Tab for details. Marvel driver required for HP Z820. Supports booting in Mac Pro 3,1 (early 2008) and newer and any Thunderbolt Mac with a Thunderbolt-to-PCIe Card Expansion System. Locking feature of eSATA connectors not supported in Xserve.